Located in Richmond, Texas, LYF Painting & Remodeling has been proudly painting in the Richmond & Sugar Land areas since 2001. Our mission is to always provide professional and cost-effective home and office painting services to property owners, tenants, and business managers in the Richmond & Sugar Land, Texas areas. We are knowledgeable in meeting all of the interior painting and exterior painting needs of Fort Bend County and surrounding towns in a complete and economical manner. If you are searching for a trusted painter in Sugar Land or a Richmond painter, contact LYF Painting & Remodeling for outstanding care and top-notch residential and office painting! 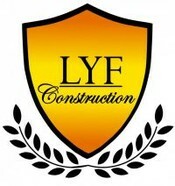 LYF Painting & Remodeling's kind, professional, experienced painters are with us year round to provide speedy, conscientious painting services in and around Richmond, Texas. You'll be provided long lasting painting materials and expert painters who'll strive for perfection. LYF Painting & Remodeling provides superior interior and exterior painters and paint products, regardless if the job calls for latex or oil paint. We love painting the Fort Bend County area! Outside painting surfaces are prepped thoroughly cleaning and scraping as needed. Quality paint then is when the surface is free of moisture and no rain is expected in the next day. Inside painting areas are primed as required. Oil or latex paint is then rolled or brushed on walls and ceilings making your Richmond area home appear new once again. Office walls are prepped as required and fill in dings or cracks. Then a tough, long lasting latex paint is applied to walls making a cheerful work environment that is pleasing to employees and customers! All of our work is guaranteed. It is our goal that every customer be thrilled with LYF Painting & Remodeling's painting services and eager to show neighbors the superlative work. Affordable High Quality Painting in Richmond. Be sure your painting contractor is professional and dependable.